I absolutely love to hunt turkeys in the spring! Nothing gets me fired up more than a big gobbler sounding off in response to my yelps, cutts, clucks, and purrs. God has blessed me with some incredible trips to the turkey woods through the years. Some of my most memorable hunts, however, have been with my kids. Calling in a big tom for a child can be just as exciting, if not more so, than actually pulling the trigger yourself. Let’s be honest, compared to hunting solo, hunting with a child requires a lot more effort and patience on our part. Having an extra person to conceal from the keen eyesight of a wild turkey can be extremely difficult. Especially when that person is fidgety, hungry, bored, cold, tired…well, you get the picture. I have found that the reward of spending time with my kids in the woods, however, far outweighs the extra work required to make it happen. The more you prepare a child to hunt, the better the experience they will have in the field. One way to do this is to let them shoot their gun before the hunt. The first time a child shoots a gun shouldn't be when they are aiming at a turkey. Also, set up a hunting scenario and walk them through it step-by-step prior to the hunt. You can do this in your back yard or just have your child imagine what it would look like. Show them pictures of turkeys online or in magazines and actually point to where they should aim. Including them in your packing, planning, scouting, etc. is another great way to prepare them for the hunt. Lastly, assure them that they will do great! Kids need to hear these kinds of things from us on a regular basis! Children don’t have the physical or mental endurance that adults do. As die-hard turkey hunters, many of us can hunt from the first pre-dawn gobble of the morning all the way to the last legal minute of shooting light in the evening. I have found that most kids have about a two hour endurance limit per hunt. You don’t want to leave a bad impression with a child by making them sit in the blind for hours on end. So, with this in mind, plan to hunt during the best two hours of the morning or evening. Midday, between morning and evening hunts, can be a great time to fish, hike, explore, and talk. Keeping the hunts short will leave them wanting to come back next time! Comfort is probably the most overlooked ingredient to a successful hunt! If your child isn’t comfortable, you might as well pack it up and go home. They won’t last long! Keep in mind that children have smaller bodies and therefore get colder than you and I do. Make sure they dress in layers and have plenty of clothes on to stay warm. Good quality boots are also a must! Their cute little designer boots look good when they wear them to school. However, after walking a mile or two in the turkey woods, cute doesn’t matter anymore! A good pair of boots will pay for themselves on the first hunt. Lastly, on those really cold mornings, a couple of one-dollar disposable hand warmers could be the very thing that keeps your little hunter in the woods long enough to bag a turkey! Teach Them in the Field! The woods are my favorite classroom! There is so much to learn with your eyes and ears in the woods. Take the time to teach your child what the different sounds are when you hear them. It won’t be long before they will be able to recognize a dove coo, a coyote howl, an owl hoot, and hopefully, a turkey gobble! Also, take advantage of the time you have with your kids in the woods to talk about God, school, the future, etc. It’s amazing how receptive a child will be when you get them away from the distractions of TV, cell phones and video games. Sometimes things don’t turn out the way we thought they would. That’s okay! Don’t let it ruin your day. 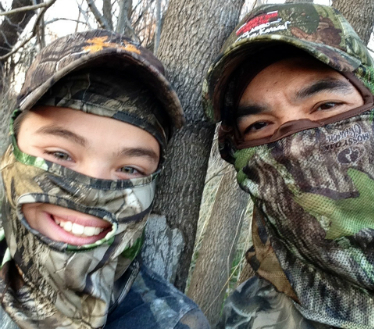 Every hunting trip should be a fun experience for your kids. If they aren’t having fun, they will definitely let you know! Walking an old creek bed or throwing rocks at a tree may prove to be the best thing you do on your entire trip. Let your child lead the way! As much as we all love to hunt, there is more to life than hunting. Simply being with your child is the reward! Hopefully, these simple tips will help you plan a successful hunting trip with your kids, grandkids, nephews, or nieces. Great memories are made in the turkey woods! So, what are you waiting for? Grab a gun and take ‘em hunting!